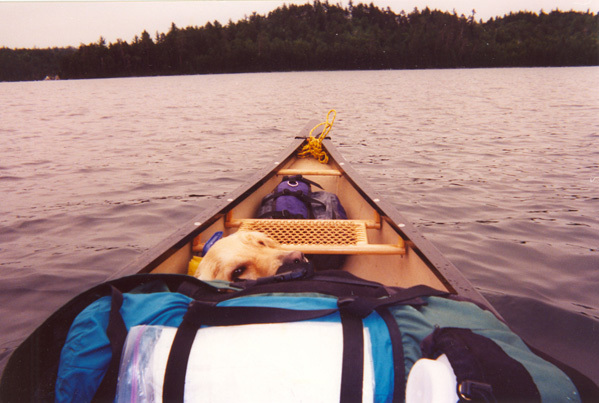 Left Sudbury around 7:00am with my solo “partner” Sasha my friendly Golden Retriever, who doesn‘t paddle but helps with the portaging of gear with her panniers. East on Hwy 17, up the Kukagami Rd. to the put in on Matagamasi Lk. Arriving approx 8:30. Road is well used but can be a bit rough, however I drive a ‘91 Corolla and never have any problem. 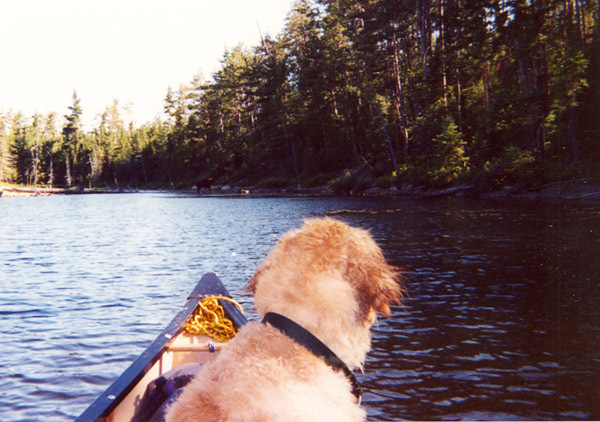 Unpack the gear and load canoe and am on the water by 8:50 heading out of the small bay and north east on Matagamasi Lk. Start to head across the lake in a NE direction past several cottages and a lodge as I‘m aiming for McCarthy Bay. Weather is gorgeous with a slight NW wind and the temperatures have dropped to low to mid 20‘s after a week of mid 30‘s and humidex readings in the high 30‘s low 40‘s. 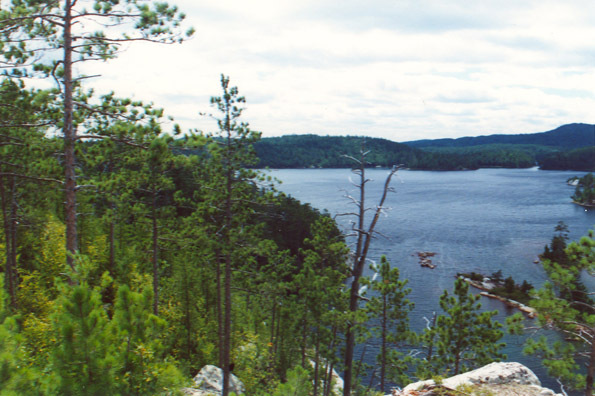 Entrance to the bay is roughly 3.5 km from the landing and about a further 7 km up the bay to the first portage. At about 10:00 am a stronger breeze comes up and for winds supposedly out of the NW, which would be quartering from my left, it‘s dead in my face, as it seems to be funnelling down the bay! With the winds forecast to be 25 km from the NW later in the day, I can only imagine what‘s in store as I head north through the smaller lakes and creeks. I arrive at the first portage at 11:10, which heads north into a wide section of Laura Creek. Portage (700m) in good shape and easy to follow along, however due to high water the put in is full of logs and I had to worm around them to get back on the water. As I walked along the portage to the left you can catch glimpses of an old log flume along the creek. Spent a few minutes checking it out but the mosquitoes are plentiful to say the least! From here it‘s about 1 km to the next portage (190m) into Wessel Lk. Portage left of creek, up hill into lake. There is a trail to left, which brings you up onto a high rock ridge overlooking the lake where people have camped( UTM 322884). With a stiff breeze blowing now and no bugs it was a good spot for lunch as well. Less than 1 km paddling brought us to the next portage into Bonesteel Lk. This portage is not that long at 120m, but with the high water I paddled almost to the bottom of the old dam structure and had a carry of about 40m left around the dam. With the brisk wind, the lake has small whitecaps and paddling is a bit of a chore, however it is about 1 km to the next portage into Irish Lk. and doesn‘t seem to bad. The portage take out is the pits, through mud, lab tea and willows for about 35 m, then steeply uphill for about 70 m. Once on top there is a good trail that‘s fairly level to the put in on Irish Lk. Sasha seems to be labouring on this portage till I notice I set her saddle bags too far back from her shoulders, a quick adjustment and she‘s fine. There is a good put in on Irish Lk., rock at the end of a narrow part of the lake. As the wind is keeping the bugs at bay, I stop to filter a couple of litres of water and the dog snoozes in the shade, she has the better job on these trips for sure! The wind continues to increase in strength as the day progresses but with the cooler temperatures (low 20‘s) the paddling is still quite manageable. It also helps that I have a Kevlar Nova Craft Bob‘s Special with a fairly low profile that I use solo and I find it can handle a good chop on the water, doesn‘t get blown around too badly and stays dry. 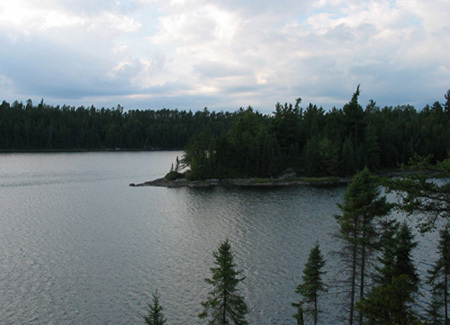 There is a small campsite just north of the put in on Irish Lk,(UTM 323912). just south of Evelyn Lk. Where I plan to spend the night. The take out isn‘t too bad, a little muddy but in low water it would be much muddier. The 1st 90m or so are along a rocky point between the creek on your left and a small bay on your right. It then swings left onto an old road and is in excellent shape to the put in. As I have been double carrying each portage, I walked an extra km on the 2nd trip as I wasn‘t paying a lot of attention and I wandered past the turnoff down to the take out and ended up in another bay and had to backtrack. The put in is on rock and you put into a small pond that then connects to Evelyn Lk., I waded the canoe through the shallow area rather then fight the wind, current and rock garden. The south end of Evelyn Lk. is shallow and I estimate the winds were approx 30km/hr, it took about 30 minutes to paddle 1km, through 1 ½‘ whitecaps to our campsite for the night. 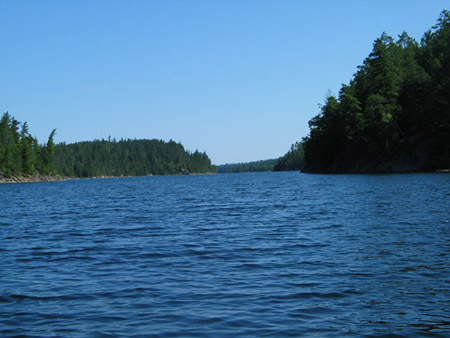 The first 2 islands on the eastern side of the lake both have good campsites with the eastern most island well used (UTM 314932). Since the area was directly exposed to the wind I chose the island due west (UTM 312932), which is more sheltered from the north and northwest winds. I arrived at 17:00 hrs. Even with the sheltering trees there was enough wind to keep the bugs at bay all evening especially as the winds stayed up most of the night. Up at the crack of 6:45 for breakfast. Wind blew all night and was still up although not as bad as yesterday yet, however will be paddling into wind most of the day. On the water at 8:10 heading north on Evelyn into Laura Ck. Lots of water, paddled till got shallow and was fighting the current and then just walked through the creek. Dog was busy exploring all across the swale bottoms in and out of the mud. Creek bottom is good with mostly sand and gravel with the odd deposit of silty material. Reached beaver dam and pushed canoe most of the way up and then climbed the dam to finish the job, the dam is probably 6‘ high. As I crested the dam there standing to my right close to the bush line but in the water was a cow/calf moose combination. Not sure who was the most surprised but the cow gave a grunt and that calf was gone like a shot with her not too far behind. Glad the dog was still down in the creek rooting around and didn‘t see them or the lot of them would probably have been ½ way to the Sturgeon River! There was lots of water above the dam and I was able to paddle thru a small pothole and up the creek to a lift over into another creek section. As long as the beaver dam holds, there should be sufficient water above to minimize any portaging to the lift over. This section to the lift-over took 55 minutes to complete but would be longer in lower water and I had even taken time on this morning to watch a Kingfisher going about getting it‘s breakfast for about 15 minutes. 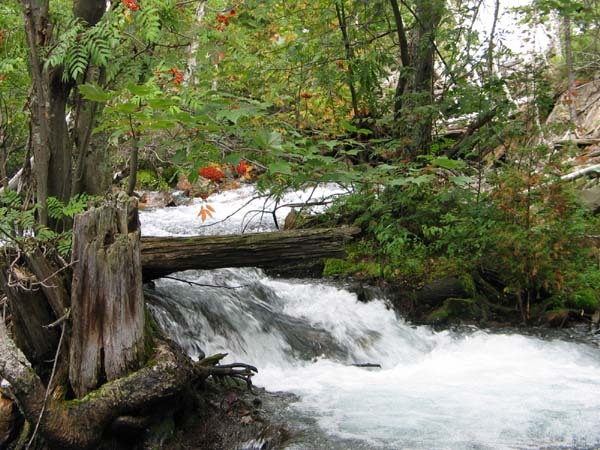 From the lift-over to the next portage is about ½ km of creek travel up to a steel bridge over a logging road. There was a bull moose feeding in the creek about 60m south of the bridge and since the wind was directly in our face I was able to paddle up to within about 35m of it. The moose was in the shadows and hard to pick out and I saw it‘s antlers moving first and the dog could smell it but not see it for a bit. Once she did see it was interesting to watch her want to go investigate but she stayed put. The moose finally saw or heard us and slowly meandered up the bank and disappeared. The portage (150m) around the bridge and a set of rapids ends in a rock pile and can be a bit awkward loading the canoe. From here on the wind is in my face at most times, but since we are still in the creek it‘s not too bad yet. I can just imagine what Laura Lk. is going to be like. It is about 1 ½ km through the creek to Laura Lk and as I suspected the wind is pushing some fairly good sized waves down the south end. 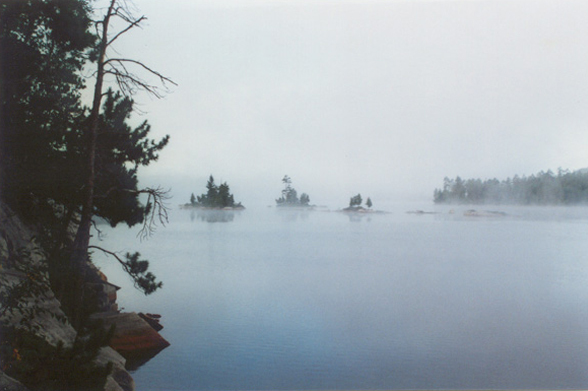 I put down my head and push off for the 3rd island up the lake, which is about ½ way to the next portage. Along the way I pass 3 canoes down bound , 3 persons per canoe. With today‘s winds I would have rigged a sail for sure. Upon reaching the island, I rest and retighten my yoke as a bolt and nut had worked itself loose and checked out the campsite (UTM 300993) . It‘s approx. 2 ½ km to the portage out of Laura Lk into McConnell Bay of Chiniguchi Lk. The last ½ km is in a weedy bay and a huge snapping turtle comes off the log it was on as we paddle by about 50m from the take out. This is the toughest portage on this route (800m) and it goes up and down over several ridges and also crosses about 175 m of bog in the middle section! Stay on the logs, the dog got off them and sank up to the her saddle bags in the muck, quite comical actually – her standing there looking at me to come get her! Once she got a good look at my back she decided she was quite able to do it on her own. Past the bog, the trail climbs a 2nd ridge and there are several huge logs across the trail. There is only 1 without a trail around it that you have to climb over. Once you start down towards McConnell Bay you run into a tree leaning across the trail, you can squeak under it with a pack but I had to let down the canoe to get under. All in all the double carry took an hour. The difference in the water‘s colour from Laura to the Chiniguchi system is immediately noticeable as the water in the Chiniguchi system has a clear blue colour. It stays this colour all the way down the system till you re-enter Matagamasi Lk. It has something to do with the type of rock in the area, much like the waters in Killarney. There is a long beach on the north shore of the bay with a great campsite area (UTM 264999) if one was looking to stay or layover. As for me I decided to push on out to Chiniguchi Lk and fight the wind out to the lake where it changes to be at my back finally after 1 ½ days of pushing into it. I land and find 2 poles and with my rain jacket, rig a sail of sorts. It works fine, I had planned on stopping for the day about 1 ½ km down the lake on the east side (UTM 245992) but the sail works so well I end sailing about 6km down to the Southeast Bay of Chiniguchi where I stop for the day at 16:00 hrs. Nice campsite on a point (UTM 238949) covered in Red Pines with enough of a breeze to keep most of the bugs at bay for the evening. Wake up to let the dog out, it‘s dead calm for the first time since I left the car and it sounds like every mosquito in the area is outside wanting in! There is a heavy smell of smoke in the air and the sun is just a red orb in the haze. I found out later that there are large fires in Northern Quebec and the smoke is travelling the winds as far south as Barrie that day. The mosquitoes are ferocious and I resort to long pants and sleeves plus head net while I make breakfast and prepare to hit the water. I‘m back on the water at 8:35 and it is dead calm, the only ripples come from the 2 loons swimming around us as we pass. It‘s about 1.7 km to the next portage into Dewdney Lk. and the mosquitoes follow us all the way. Excellent portage into Dewdney Lk (540m) this is one of my favourite portages anywhere, fairly level not too long and some of the most amazing tree specimens around. There are some huge White Pine, White Spruce, Yellow birch and Poplar growing along the trail. There is one huge pine close to the Dewdney Lk. end that if you look closely at you can see an old lightning strike that spirals down the massive trunk. Back on the water at 9:35 and heading down the lake. There is an old Lands and Forests tower cabin on the eastern shore of the lake just west of a small swale/creek leading into Franks Lk. 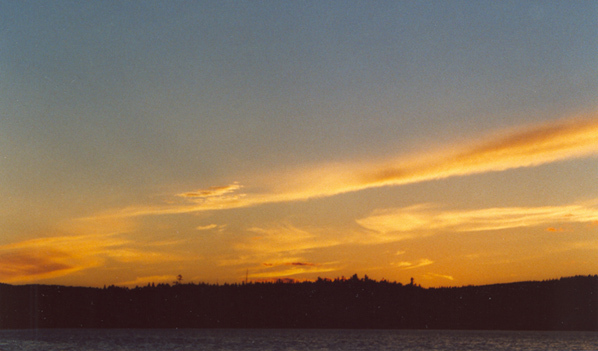 The tower is visible on the high point east of Dewdney and north of Franks Lk. You paddle through a narrows about ½ way down the lake, which is full of huge rocks many with paint and aluminium marks on them! 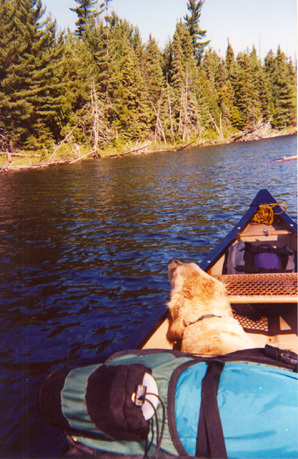 The portage to Wolf Lk., is down a small bay at the south end of the lake. 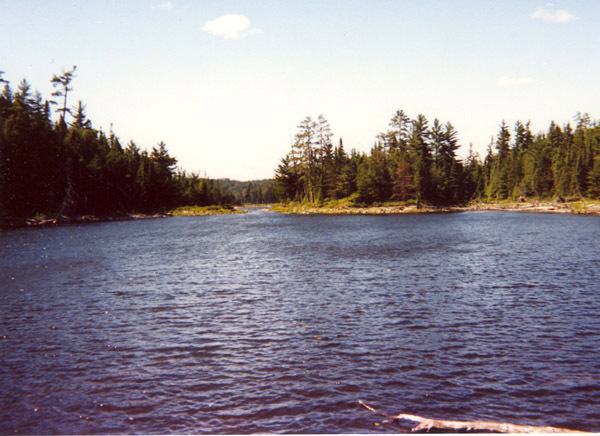 Portage left out of Dewdney (200m) it crosses a logging road then down through a natural rock groove to the water. Wolf Lk. 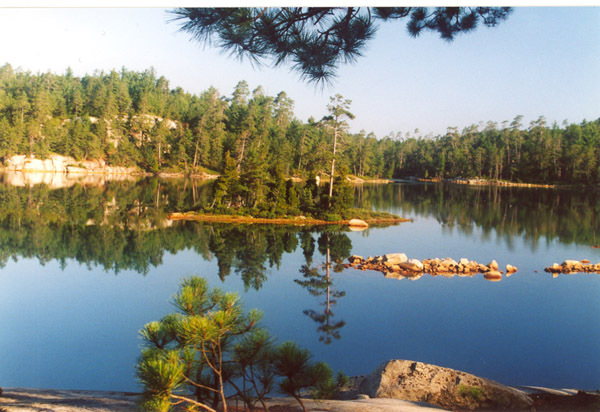 is one of my favourite lakes, it is ringed by large rocky hills and ridges, and Red Pine stands. There are several campsites around the lake and I have laid over here for a couple days on past trips, relaxing and hiking the ridges. On the west shore about mid lake there is an abandoned gold mine site. There is not much left, some rotten barrels and lumber and quite a few metal drill core tubes sticking out of the ground all over the site. We stop for lunch at one the campsites on the east shore but the mosquitoes don‘t give us any peace so we move on. 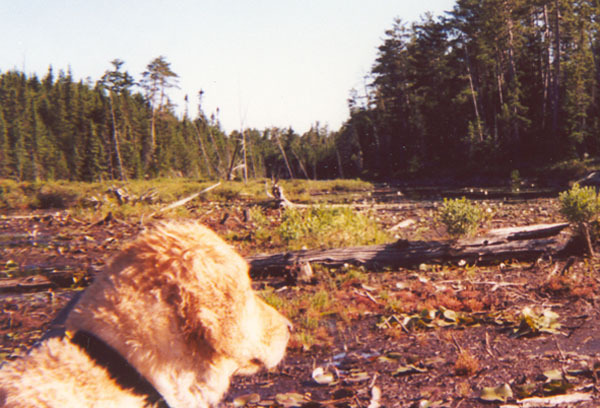 There is an old trapper‘s cabin on the west shore at the channel leading to Silvester Lk. The channel has a small chute that drops slightly into Silvester. The water is high enough on this trip that there is hardly a ripple and we just float right through. In the past I have had to line through here as there are quite a few rocks in the chute that are exposed in low water. 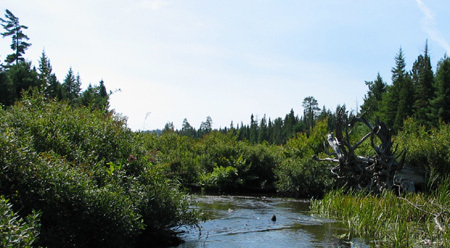 Silvester Lk is about 1.7 km long to the next portage. The eastern shore is a huge Red Pine covered ridge, quite impressive. 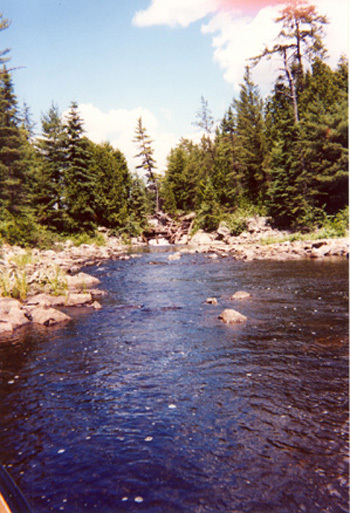 Another highlight of this route is the area the adjacent to the portage past the next section of the Chiniguchi River. 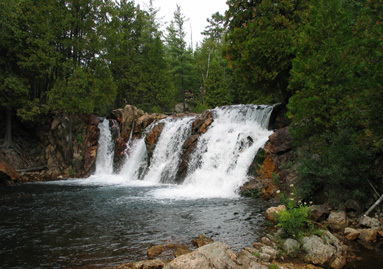 The river funnels through a rock chute and then passes over series of waterfalls. There is series of pools along this stretch and one of them on the western side of the river is a notable swimming hole, “Paradise Lagoon”. 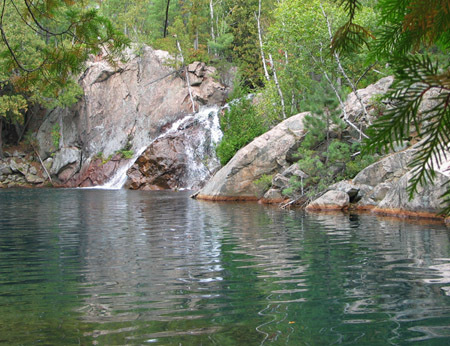 Take the time to explore the area, take pictures and have a dip. The portage (350m) often gets narrow and has some sections with steep embankments down to the river, so exercise some caution. The put in is in a small pond area that is only about 300m to the next channel or chute into the north arm of Matagamasi Lk. You can portage around the chute or run/wade/line down. If portaging, the take out is in a stand of cedar trees just before the river narrows through some boulders. 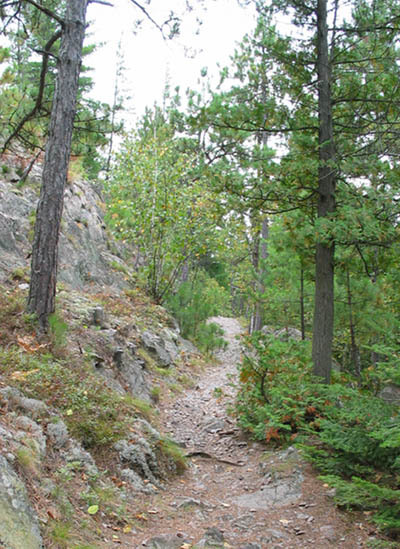 The portage (300m) is a good trail through although there was a new tree down across the trail since last year. 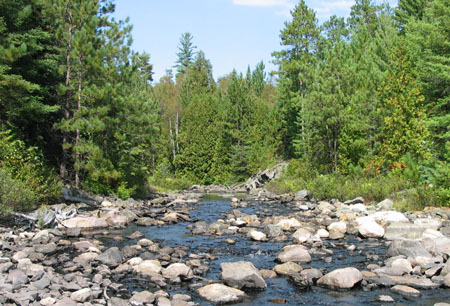 The put in is in a rocky area and in low water can be quite muddy. We are on the water again at 13:40 after lunch and the take out/access point is about 8 km south. The sun is still obscured by smoke and haze and there is still not much wind and lots of mosquitoes. The north arm is fairly shallow and there are many water lilies present down both shorelines. I pass another group (4) canoes heading up the system about 5 km from the landing. At this point the sun finally appears as the wind comes up and just for old times sake decides to blow in my face for the last hour of paddling to the car! Arrive at the car at 15:30 and after loading gear, having a quick swim and changing into a clean set of clothes, I head off for Sudbury at 16:15 and will be home for a cool beer and supper.